JSW Jaigarh Port of Maharashtra was inaugurated on August 22, by Shri. Narayan Rane, Hon’ble Minister for Industries & Ports, Govt. of Maharashtra. JSW Jaigarh Port is the second largest port in Maharashtra in terms of draught and ability to handle ships bigger than panamax vessels. MV Zhen Hua-4 was the first vessel to be berthed in August. An all-weather, deep-water, multi-commodity, greenfield port owned by JSW Group. located in Dhamankhot bay on the western coast of India. 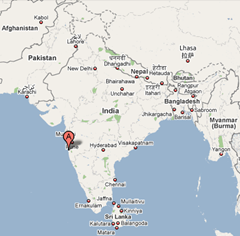 200 km north of Goa and 360 km south of Mumbai by road. 42 km from the national highway NH-17. To meet the coal requirement of JSW Energy (Ratnagiri) Ltd. for its 4×300 MW thermal coal based power project. To handle additional cargo including coal, bauxite, raw sugar, ash, cement, iron ore, fertilizers, edible oil, molasses and completely/semi knocked down kits. The Port is designed to maintain pollution levels to a minimum prescribed level. equipped with two berths of 550 metre quay length to handle 105,000 DWT vessels with a draft of 14 metres. to handle bulk, general and container cargo using ships gear up to 10 Million tons per annum. set up with an investment of INR 677 crore. cargo handling to be increased to 20 Million tons per annum. would be capable of handling 180,000 DWT capacity vessels with draft of 18 metres. five more berths spanning 1500 metres to handle multiple cargos will be constructed with modern container handling equipments. Rail, Road connectivity with the national grid and inland waterway projects are being taken up simultaneously. One of its Group Company “South West Port Ltd” has developed Berth no. 5A & 6A in Mormugao Harbour on BOOT Basis and has successfully handled 20 million tonne of cargo. For more details on JSW Jaigarh Port, log on to JSW Infrastructure Ltd.